Start with your dream, why not? We can always change the material or perhaps schedule extras for a future phase. This is the beauty of landscaping, and it is often better to do the work in phases, let the plants grow a little, experience your landscape through the seasons. This is often when the best “visions” come. Things are sometimes difficult to envision when all you see is mud everywhere. Now consider reality. Almost every landscape has its problems before we even get started. Erosion, driveway turn around space, water run-off or puddles, muddy access to the house, lack of shade, too much shade, and fire danger to name a few possible problems. We will address each of these; Custom Landscapes specializes in landscape problem solving. How is your landscape going to be used? Will you be entertaining? Do you have children playing? Dogs? Summertime barbecues, cocktails on the veranda, vegetable gardening, or hanging in the hammock are popular favorites. What is your lifestyle? Perhaps you want only to see your landscape, you want it to look nice year round, and you want low maintenance. 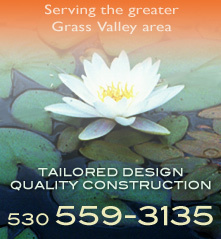 Whatever it is, a Custom Landscapes design will be tailored to your needs. How do you get there? This is important because landscapes are often enjoyed much more when they are easily accessible. Also consider that a porch or patio built at the same level of the house allows effortless in-out access to the outside. This is the first invitation to frequent enjoyment of your custom landscape. A secondary invitation to further enjoyment is a visual destination. This might be a distant bench or maybe a path that disappears and begs for further investigation. Pathways are important in Nevada County; mud is a deterrent, we can’t just walk back into the house without removing the muddy shoes. This sort of inconvenience will limit your enjoyment. Pathways provide easy access to your landscape and should follow actual travel routes. Consider how you move about on your property. Trips to the wood shed, to your garage, or guest parking, and of course to your front and back doors. The process of path layout helps us with the remainder of the design by creating negative shapes. These areas might become planting beds, lawns, ponds, patios, etc. Lawn might be a good access route in the summer but not so choice in soggy weather conditions. Custom Landscapes will save you the headache; we consider your access first. It is important to have a general planting plan before getting started. Although planting is done toward the end of the installation, irrigation for those plants is installed toward the beginning. Lawn areas are best irrigated with pop-up sprinklers, while trees, shrubs, and perennials are often watered by “drip” irrigation systems. Some ground covers that will spread over an area might thrive better with overhead spray watering. We know a lot about which plants work and where. Also about deer resistance, erosion controlling plants, vegetable gardens, natives, etc. Final decisions on specific plants need not be made right away. The pressure is off, Custom Landscapes tailored designs are a process, and we will help you through those tough decisions. Sign up to be notified of our specials, workshops, and news! Don't worry you won't get bombarded.